Being asked to donate bowls for a local soup bowl dinner was the motivation I had to try my hand at becoming a potter full time. That challenge tested my skills to see if I would be able to mass produce an item with consistency and to meet a deadline. It was fun. I donated 25 bowls. Each one decorated similarly with frogs and a colorant swirl to give the illusion of water. I understand they were a hit and were some of the first bowls to go. Now, with the economy still having effects on all of us, the Shenandoah Alliance for Shelter is having an additional fundraiser to try and help local folks make ends meet. I was again asked to donate an item. This item could be a single item and would be used in a Bingo style fundraiser. I have wanted to do some frog vases so this was the opportunity to do several and let them have first pick at the lot and the rest could travel to Blandy Farm with me on Mother’s Day. 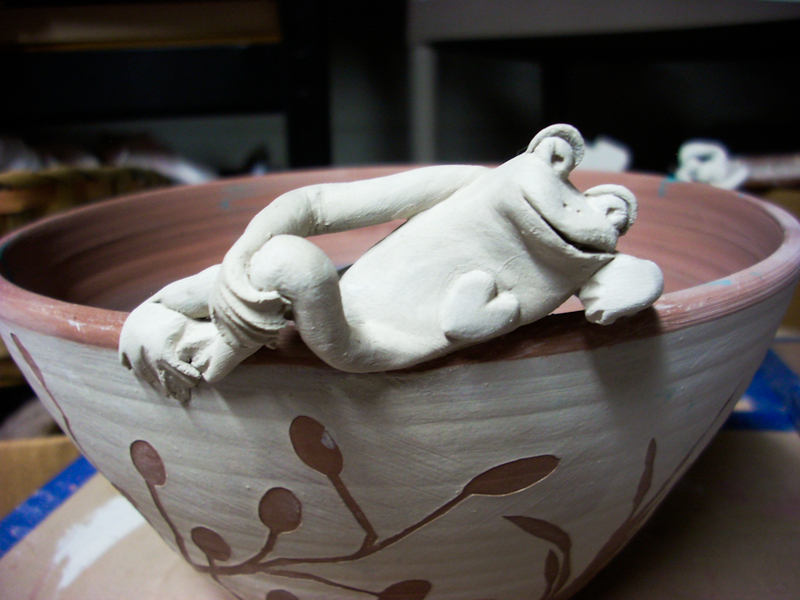 Here are the four vases that I made for the shelter… they chose the one with the froggies holding hands and I have to say, I think it will be a popular item but more importantly, I hope they are able to raise funds to help folks that are trying to make ends meet.